Recently a New York auction house damaged a $70 million Picasso, "Le Marin," while preparing it for auction. The painting is owned by media mogul Steve Wynn and isn't the first Wynn-owned Picasso damaged just prior to sale. In 2006 Wynn put his elbow through "Le Reve" while showing it off just prior to selling it. Maybe Wynn shouldn't own Picassos or at least not try to sell them. "Le Reve" was restored and eventually sold in 2013 without mishap. Hopefully "Le Marin" can be restored as well. One of the hazards of owning expensive pieces of art or other collections is the possibility of damage including catastrophic loss, such as from flood or fire. Even if restored, the overall value is usually diminished. In the case of a fire, the water used to extinguish it can ruin many items, especially paintings. There are non-damaging fire suppression systems but they only operate in controlled environments. Besides clumsy or careless owners, other hazards include damage in transit, mold/mildew, theft, improper storage, or someone damaging it intentionally. Most museums can afford state-of-the-art protection which now includes specialized LED lights to not only protect paintings from light damage but to actually make them prettier. The Getty is designed to withstand earthquakes and wildfires such as the one that came close in December. Coverage reviews - Maintaining adequate coverage is vital. AIG can assess how your existing coverage compares to current market value. They provide ballpark overviews by category as well as supporting sale examples. Following a schedule review, they can organize valuation solutions using professional appraisers. Vulnerability assessments - To help prevent unnecessary losses, AIGs site assessments identify potential "threats" including transit, storage and home exposures (fire, theft, water damage). They also advise on curatorial management (traffic patterns, climate, installation methods), documentation and tracking, insurance appraisals and catastrophe planning. Following their visit, they prepare a report highlighting all exposures and include specific recommendations to reduce the likelihood of incidents that could damage the collection. Emergency planning - Customized, pre-event mitigation plans can significantly reduce the severity of losses due to house fires, brush fires, hurricanes, earthquakes or other catastrophic events. They address a variety of topics, such as forming an emergency response team, minimizing post-event damage, compiling a priority removal list, and acquiring proper handling materials and instructions. Referral services - To ensure the highest level of service, they maintain a panel of carefully vetted appraisers, conservators, art-handlers, storage facilities, shipping specialists and inventory companies who are leaders in their fields. They can oversee the entire conservation, transportation, appraisal or inventory creation process. Superior claims service - How many claims adjusters can distinguish a Cy Twombly abstract from a Wassily Kandinsky expressionist painting? All of them-when they're part of AIG Private Client Group, a division of the member companies of American International Group, Inc. (AIG). 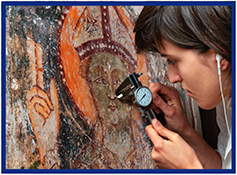 Their collection specialists work closely with their claims staff to provide conservator referrals, locate appraisers, review treatment proposals, and oversee packing and shipping arrangements. If an item is lost or stolen, they make every effort to recover it. AIG's Private Client Program is available to registered Big "I" Markets agents in all states. Questions? Collect your thoughts, head over to Big "I" Markets and click on Affluent Program - New Business to learn more! Have You Seen Our YouTube? Take a moment to check out IIABA's redesigned YouTube page. 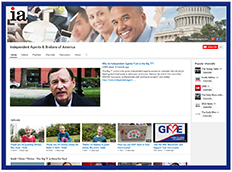 You can always watch videos without subscribing, but subscribing to our channel is a great way to keep abreast of the many great initiatives happening at your association, such as this new video on the GIVE Campaign, a week long campaign dedicated to giving back to the community backed by the Big "I" Young Agents. You can also review the latest Trusted Choice resources, dive into Big "I" community news, or get caught up on industry tech trends with the Agents Council for Technology. Be sure to share with all your agency staff, too! And don't forget to click the red "Subscribe" button at the top right of the page to keep ahead of the curve on the latest Big "I" news. While you're checking out videos, take a look at our BIM YouTube tutorials! Our very brief videos walk you through commonly requested information such as How to Request a Quote on Big "I" Markets, How to Request a Quote for Cyber Liability, and more. We'll see you on YouTube! Last week I was watching a channel which only shows old game shows (insert your own joke about how lame I am) and a woman won a trip for four to Washington D.C. I was surprised that she was so excited about the trip until I started thinking about it. DC has a lot to offer tourists that locals take for granted. I have to admit I've lived in the D.C. area my entire life and I've never visited the Exorcist Stairs in Georgetown. There are dozens of world-class museums and the National Zoo most of which are free to visit. DC also has scores of world-famous national monuments which are featured in a multitude of movies, the Washington Monument alone is the #3 most famous landmark in the world to be damaged or destroyed in movies. 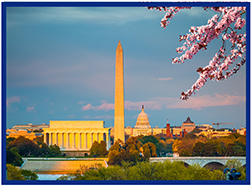 Head outside D.C, into Maryland and Virginia and within an hour or so you'll find historic cities, civil war battlefields, wineries, and the homes of several U.S. presidents including of course Mount Vernon. I recommend the candlelight tour they offer around Christmas. No wonder Washington D.C. is the 7th most visited U.S. city. Millions of visitors will descend on the city this summer and then in the fall after most of the tourists have left schools will sponsor class trips, not to mention all the marchers coming for a wide variety of rallies and protests happening year-round. No matter why they come here all of these travelers have to plan their trip, but how many thinks to insure it with Travel Insurance? The typical plan will cover emergency medical expenses, baggage loss and delay, and recover at least some of the cost of the trip if the vacation had to be canceled or cut short. As a Big "I" Markets agent you can offer your clients travel insurance through our partner carrier Travel Insured International. Opt-in for Cancel for Any Reason Coverage, and your clients may cancel their plans and get up to 75% of their total trip cost for any reason they choose. They just have to have purchased within 21 days of deposit (other eligibility conditions must also be met) and cancel 48 or more hours prior to scheduled departure in order to be eligible. The TII travel blog covers a myriad of travel related subjects, including travel agent myths, air travel tips, picking the right hotel, protecting your baggage, using a cellphone abroad, navigating hurricane season, and more. Travel Insurance International help desk can be reached at (800) 243-3174. World Trip Protection PLUS not available in NY. Congratulations to our agent in Congratulations to our agent in Montana on a Habitational - Apartment Program sale of $5,137 in premium!